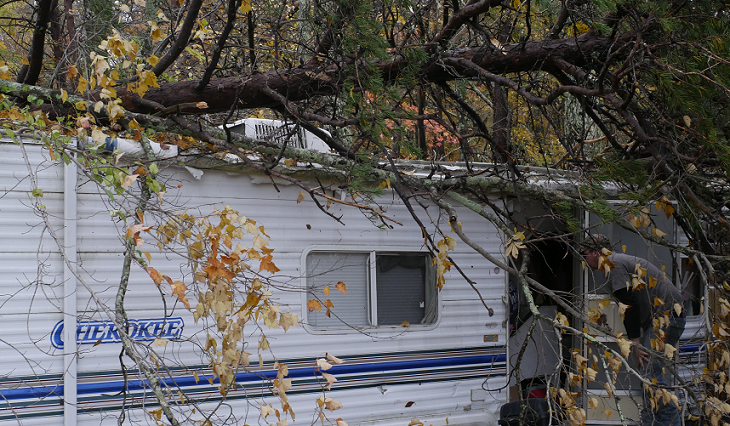 Karen House : Nov. 6, 2018, 9:56 a.m.
William Williams inspects damage to a camper in his yard after a suspected tornado swept through north Sequatchie County early Tuesday morning. Additional scenes from Nov. 6 severe storm on Features page. UPDATE 11/06/2018, Noon: At about noon Tuesday SVEC CEO Mike Partin clarified the damage in Sequatchie County, saying by telephone that about 800 customers in Sequatchie were without power. He said he hopes to get that restored by Wednesday morning. Most of the major damage, he said, was in Grundy County. As to whether it was straight-line winds or a tornado, Partin said based on the fact that the trees were not twisted he thought it was straight-line winds, although the storm clearly left a straight track along the edge of the plateau. UPDATED 11/06/2018 11:41 a.m.: The tally of outages has been corrected to 6,900 in SVEC service area, and 1,000 of those in Sequatchie County. Election Administrator Jerrie Hickey said the Cagle precinct is the only voting place without power, and the voting machines are running on batteries. If the batteries run out, they will use paper ballots. Nov. 6, 2018 – Thousands of people are without power in the service area of Sequachee Valley Electric Cooperative (SVEC) following severe weather that blew through about 2 a. m. today. At 9 a.m. today SVEC reported: “We still have approximately 6,900 without power, but no estimate on restoration at this time. Crews are still assessing the damage.” That number includes roughly 1,000 households in Sequatchie County. The largest number of outages is in Grundy County. Winfred Smith, Emergency Management director for Sequatchie County, was out surveying storm damage early Tuesday morning. One man had trees toppled all around his house, but none hit his house, Smith said. Sequatchie County Schools, which had planned a two-hour delay this morning in anticipation of the weather, are now closed for the day. Roads that were blocked by trees and power lines at daybreak included TN 399 and Stooping Oak Road on Cagle Mountain and some areas of Daus Mountain, Smith said. Calvin and Christy Moffitt with two of their three children. Awakened by a storm alert on their phone, they hid the kids under an overturned couch as the storm went through. Calvin and Christy Moffitt were awakened at 2 a. m. by the severe weather alert on their cell phones. 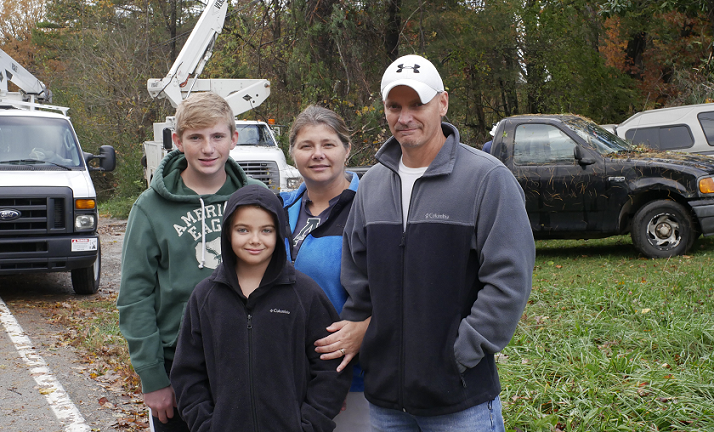 When the Moffitts checked the weather on Channel 9, they heard that a tornado was coming from Grundy to Cagle – right along TN 399, where they lived. “Everything went out and we heard a tree cracking,” Calvin said. “There were loud noises,” Christy said. “And we prayed,” Calvin added. “We prayed! Yes, we did,” Christy said. Early Tuesday morning a Channel 3 news crew stopped at the Moffitt house to make sure they were okay, and then Constable Travis Sherman checked on them, as well. By 7:30 workmen from BTC were working to clear a fallen tree from off the Moffitt's pickup truck and the power line in front of their house. “It was rocking our trailer while she was on the phone with them,” William said. 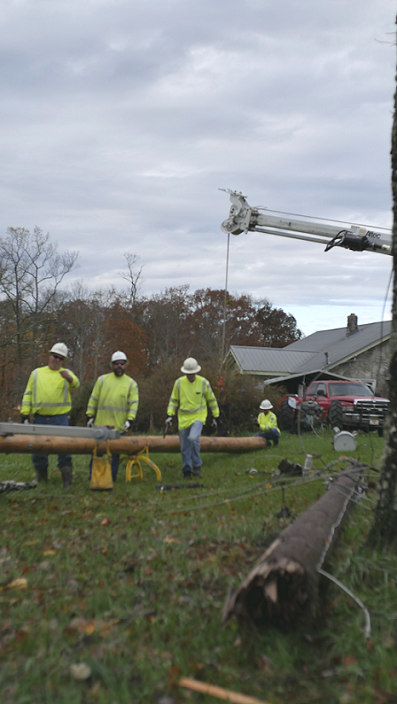 Workers from Service Electric Company work to replace a snapped power pole on TN 8 on Cagle Mountain. Downed trees destroyed a storage building and a camper trailer on their property, but so far no damage has been found on the two homes. Mechelle's mother, Wanda Bowman, said a couple of friends from Manchester had planned to visit and stay the night, but when they heard about the possibility of storms, they decided against it. “They would have been in that camper,” Mrs. Bowman said. “I'm not no meteorologist or nothing, but I believe we had a tornado,” Mechelle said. As of Tuesday morning, it has not been determined whether the damage in the area was due to a tornado, straight-line winds, or both, but evidence is leaning toward a tornado. Hail was reported on Smith Mountain, which is associated with tornado activity, and Winfred Smith said the way the trees are snapped off in the middle looks like a tornado. A meteorologist from the National Weather Service (NWS) in Morristown, Tenn., was on his way to the area today, to evaluate storm damage, Smith said.